Emirates promo code - get 10% discount on all flights! Return flights from Prague to Mahé, Seychelles from €488! Saving some decent money when flying on board of this top ranked carrier (Also awarded as “Airline of the year 2016” by Skytrax is possible with recently released new Emirates discount code 2019! With this voucher you can easily discount your next flight with Emirates by 10% when departing from main airports in Germany. As usually the discount is calculated off base fare. This Emirates promo code does not discount any additional services. Note that this promo code discounts all flights in Economy, Business as well as First class. You can book your next discounted flight with this top ranked carrier from Frankfurt, Dusseldorf, Munich or Hamburg. You can enjoy latest Emirates promo code in next few days..hurry up if you plan to use service of this carrier and want to save some decent money.. If you want to apply this Emirates promotion code go to “Advanced search” where you will find separate box “Promotional offers”. Aply this voucher and if it is still valid you will instantly see confirmation of availability. 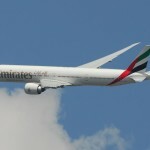 Simply proceed with your search and your next Emirates cheap flight will be automatically further discounted..
Emirates promo code from Germany is currently valid for all bookings made by 30th of June 2019. Travel period is then from 20th of April to end of December 2019. No code share flights. available for return tickets only on Emirates. Only works when booking round trip flight via their main hub in Dubai, United Arab Emirates. Also you may check latest Emirates promotional deals here. Once you apply this Emirates promo code you would find below “golden mark” next to the fare type. If you can see it your next flight will be automatically discounted by 10%. Again this Emirates discount code is available only when departing from Germany to all destinations in scope of this airlines. Other way to save from Europe on this airlines is using this Emirates promo code from the United Kingdom. Booking sample of successfully applied Emirates promo code 2019 from Germany to Australia. In this case you would depart from Munich to Perth on 10th of December 2019. Inbound flight from this Australian city back to Germany would be on 15th of January 2020. You would easily save €95 just by using this working Emirates discount code.